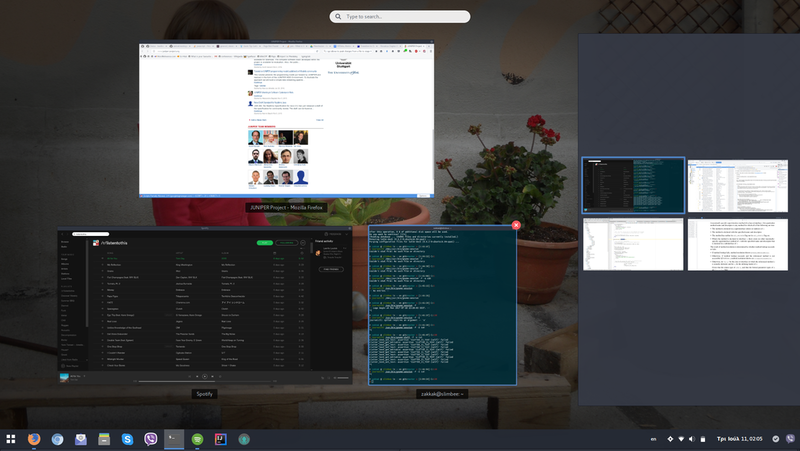 Can I have 2x2 workspaces in GNOME 3? I have just upgraded to Ubuntu 17.10 and found out there is no option to have 2 by 2 workspaces. I was able to configure 4 "static" workspaces using GNOME Tweak Tool, but I would like to have them in 2 rows by 2. Any ideas? Arranges workspaces in a configurable grid. updates workspaces sidebar with grid configuration (use Remove Workspaces Sidebar if you don't want it). From the extension's preferences you will be able to set your preferred layout (e.g. 2x2, 2x3, 3x3 etc.). You may see its GitHub page for more detailed info. Officially it doesn't support GNOME v3.26 yet, but it should work fine. Otherwise, you may be able to make it work adding "3.26" to its metadata.json file. It worked out of the box without changing anything. Even my old custom shortcuts worked. Currently the extension doesn't work with Gnome 3.32 and it might take a while before (if) it again will, because it's the current maintainer (thanks zakkak) is looking for for volunteers to take over maintainance). Suitable replacement can be Workspace Matrix which has a bit less features, but the main features are present. Not the answer you're looking for? Browse other questions tagged 17.10 workspaces gnome-shell gnome-tweak-tool or ask your own question. How can we make the work spaces like 2X2 Grid on Ubuntu18.04? How do I install and manage GNOME Shell extensions? How can I script the settings made by gnome-tweak-tool? How to remove right-side workspaces panel in gnome-shell? How to remove empty gnome workspaces?